Who the $@%! is Melvin?! Earlier this week, I celebrated my one-year anniversary working for my current employer. I had completely forgotten the significance of the date, until HR wished me a “happy anniversary!” mid-afternoon. An hour later my boss pulled me into his office to give my me annual review. To call it positive is an understatement. Let’s just say it’s nice to feel appreciated. I love the company, and my job is the best! Ten years ago, I took a job with a health insurance provider. I’d been unemployed nearly a year, and quite frankly, was desperate for work. Why else would I end up working in a call center for a few bucks more than minimum wage? The office was located in a high-rise in downtown Portland, which was pretty cool, but the commute via mass transit was not. The work was grueling and tedious, and I was miserable there. It’s a wonder I lasted ten months! Anyway, being a call center, I was basically chained to my desk all day long, tethered there with a headset. Even our bathroom breaks were monitored. So when an opportunity arose to tackle a special project for the accounting department, I jumped at the chance. The work was monotonous – basically, it involved transferring member files – but it was quiet, and I was off the phones for a whole week. That first day I opened the drawer of the abandoned desk where I was working, looking for a pen, and found a CD that had a single word scrawled on it with a blue Sharpie. I slipped the disc into the CD slot, and listened as a series of soulful R&B tunes played. I did not recognize the artist or the songs, but was immediately captivated by the music nevertheless. Tracks like “The Love I Lost” and “I’m Weak For You” and “Bad Luck.” And a couple of familiar ones: hey, it’s that Simply Red song, “If You Don’t Know Me By Now!” And there’s the disco hit “Don’t Leave Me This Way.” I listened to that CD all week long, and when the work assignment was up, I took a copy home for myself. Listened to it on occasion, and never grew tired of the soulful harmonies and often-inspiring lyrics. For years, I had no idea who “Melvin” was. A few internet searches yielded no obvious results. This was before apps like Shazam existed. If you’re unfamiliar with Shazam, all you do is press a button, and your smart phone “listens” to the song that is playing. Within 30 seconds, it tells you who the artist is, as well as the name of the song and the album. There’s even a handy link to download the MP3, if you’re so inclined. Boy, that would’ve been really helpful in 2004! Instead, I just enjoyed the music, even if I had no clue who sang it. Years later, I had the idea to Google a snippet of lyrics, and found they were attributed to Harold MELVIN & The Blue Notes. Only one of the most popular soul groups of the ’70s! I was thrilled that I’d finally made the connection, and solved the Melvin mystery. Since then, we’ve picked up three Harold Melvin & The Blue Notes albums for our record collection, and enjoy listening to them when we’re seeking a respite from our usual rock ‘n roll. It’s good stuff, man. Here’s a clip. In other news, we woke up to snow today. In fact, it’s still coming down at a good clip right now, and on top of that, we’ve got gusty east winds blowing. It’s not supposed to get above 29 today, which is bitterly cold for Portland. Talk about a blustery day. Remember when I was all excited because our low dropped to 23 a couple of weeks ago? Well, it’s been in the teens since, and this weekend could drop to 10 degrees, which would be the coldest temperature here in 24 years. Portland hasn’t had a low in the single digits since 1950, so if that occurs, it would be historic. This winter is shaping up to be a doozy! I know it’s not much, but by Portland standards, this is a snowy commute. Anyway, even though the snow hasn’t amounted to all that much – just an inch or so, tops – it’s funny, because up until last night, every meteorologist in town was predicting no snow for Portland. It was all supposed to hit Salem and Eugene, leaving us high and dry. I think there’s too much of a reliance on computer models these days. All of them showed the storm tracking south. In reality, it came ashore 50 miles north of where it was “supposed” to, which put us right in the bullseye and gave everybody a surprise snowstorm. The smartest computers in the world can’t predict all the curveballs Mother Nature can throw at you. I like to joke that the most accurate weather model is the GOLU. That’s “Go Outside, Look Up.” That one never lets you down. With the snow and cold, you’d think we’d be eager to hunker down and stay inside this weekend, but instead we’re planning a trip to the Columbia Gorge tomorrow. When it gets this cold the waterfalls ice over, leading to some spectacular photo opps. It’s a rare event that only occurs every few years or so, and we want to take advantage. We’ll just pile on coats and scarves and gloves and bring along a thermos of hot cocoa, and enjoy the scenery. That story about Melvin was very heart-warming and I’m so happy you shared that with us. Congrats on the snow…I know you are really excited about it. I think you should take some blankets as well as the usual provisions. The Gorge can be pretty unpredictable and bad weather can sneak up on you pretty fast. Remember the ice storm we had in ’95? I was stuck in Troutdale with no way of getting home until the next day. Vancouver didn’t have a speck of ice or snow. I think David thought I was lying to him when I told him I couldn’t get home. I do remember that ice storm! I’d only been living here a year, and I remember heading out to Target over on Glisan and seeing layers of ice coating the shopping carts. It was quite a sight. We’ve only had one other ice storm since, back in 2004. Since they have occurred once every 9 years since I’ve lived here, that means we are due for another one in…gulp…any day now! Which is funny, because looking at the forecast for Monday night/Tuesday, all I can say is…hmm. And yes, we’ll be careful and go prepared. I’m so glad we don’t have snow yet. I hate winter. Mostly because my car hydroplanes like crazy so driving in it is terrifying. The temps have been bitter though. It’s 4 degrees outside. 4. WTF?! For me, it was still a long wait for the job I loved, not to mention a second, longer stint of unemployment. Sheesh. Glad I didn’t know then what I do now! But everything works out as it should, I’m convinced of that. Hope you stay warm this weekend and keep on avoiding that snow! Mark, I can hardly believe it’s been a YEAR since you started that job because it feels like yesterday you mentioned it on your blog. And congrats on your excellent review! And yes, isn’t it great to know that you’re appreciated? I freakin’ LOVE Melvin and The Blue Notes! OMG…hearing that song again brought back a rush of wonderful memories from the ’70’s for me! “If You Don’t Know Me By Now!” LOVE that song!!!!! Hey listen, I would take ANY snowfall right now, so I am very envious of the inch or so that YOU got. Yesterday it was so warm and humid here, you have thought it was SPRING. However, this weekend we’re getting some snow – supposedly. It’s nice and COLD out right now. Bring on the snow! Have a great weekend, Mark and Tara! I can’t believe I’ve been here a year, either. If you want cold you should be here in Wisconsin. It’s 13 below at 6:22 am. We hit 7 Saturday morning. Which, I realize, is twenty degrees warmer than your temp…but at that point, it all feels pretty much the same! Gosh, Mark, congrats on the one year anniversary. I can’t believe it’s been that long! How does time fly so quickly? The trip to see the frozen falls sounds fun. Can’t wait to see your photos. Thanks, Kathy! I’m amazed at how quickly 2013 has gone by. Especially with all the big changes Tara and I have been through. It boggles the mind! Hope you and Sara had a nice weekend. Well, I’m glad you got that mystery solved! Some snow for you! 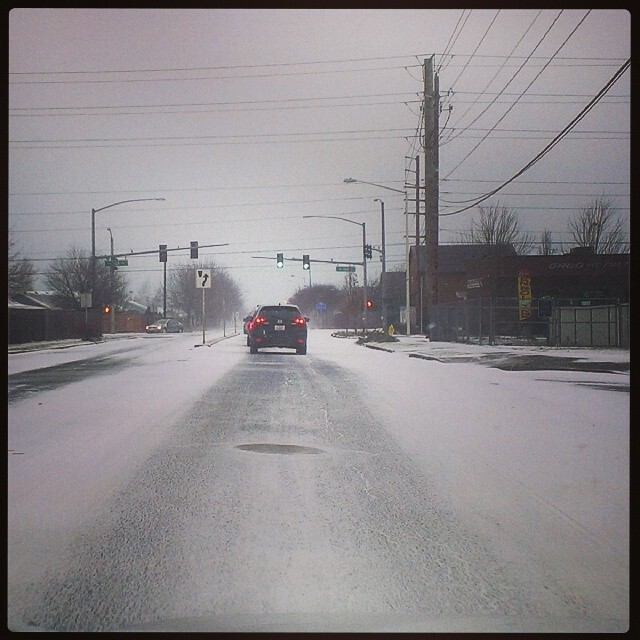 I bet there were a lot of accidents because people have forgotten how to drive with a bit of snow on the ground. With all your talk about weather I was going to do a post about living in the bush & weather, but you don’t follow me so you wouldn’t get to read it anyway. Suffice it to say GOLU figures quite prominently in my tale! I do too follow you! Love your Tickle Me Tuesdays. So by all means, do a weather post! I’d love to read it. Sorry Mark, you must not comment a lot or I would remember you as a follower! Apologies, apologies! I have added the weather post to my draft file.